We had already developed the Model B from the popular AZ2 series and were getting plenty of positive feedback. 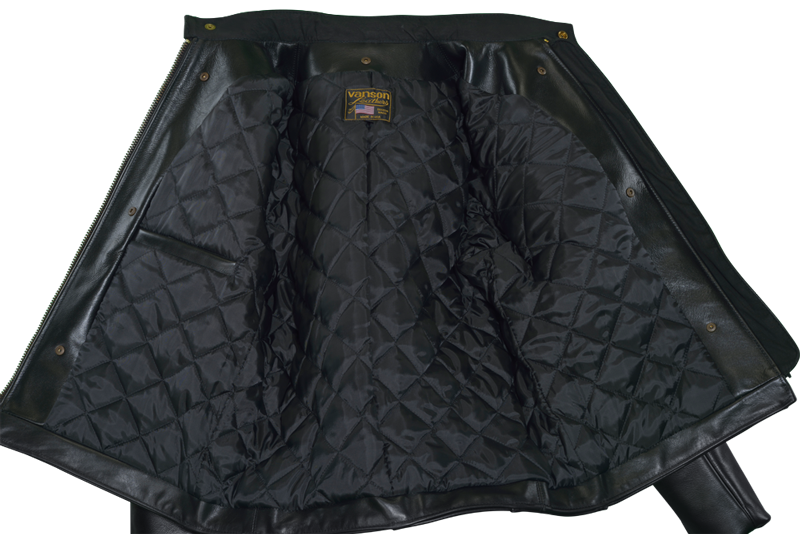 But then some people felt that a simple plain quilted lining would be more convenient than a removable zip-in-zip-out liner. And that by continuing the quilt down the sleeves as well, the coat would be a little warmer. People loved all the pockets and comfort features of the B series, so we created the Vanson Model D by incorporating a full sewn-in lining using insulating, non-bulky 4 oz. poly-fil quilt. The Model D is the quintessential classic leather motorcycle jacket. Wear it with a T-shirt, wear it with a tie... either way, it looks great and has a comfortable relaxed fit. Side belts with solid brass buckles taper the waist for comfort while accentuating the broad-shouldered cut. A generous map pocket secured to a full leather inside facing, sleeves with low-bulk wrist-zipper gussets, and a full leather windflap... this hand-built jacket exudes versatility. The Vanson Model D will also accept the Vanson Streamliner snap-in vest for even more warmth on the coldest days. Size 42 ---Chest measures 48.5 inches ----Normal ease is 6.5 inches. Back length is 25.5 - Front 22.5 Sleeves are 35.5 Nape of neck to Wrist. more bulky than a standard rayon lining.